Offshore wind energy refers to the use of wind turbines in the ocean or large freshwater areas to generate electricity. A group of interconnected wind turbines is referred to as a wind farm. As the U.S. seeks to develop renewable, homegrown and cost-effective energy sources, we’ve seen a surge in proposed offshore wind energy projects. As of October 2018, there is only one operating offshore wind farm in the U.S., but there are many new wind energy projects being proposed, ranging in size from four to 100 turbines each. As this industry expands, it’s important to understand both the benefits and negative impacts that offshore wind farms can have on our marine environment, coastal economies and recreational use areas. Put simply, because of the dangerous threats to our coast from climate change, the Surfrider Foundation supports offshore wind energy development if it is done right. Given that offshore wind is such a new technology, offshore wind development projects are evaluated on a case-by-case basis by Surfrider’s network of chapters. Surfrider Foundation’s Eastern Long Island Chapter actively seeks to communicate scientific information to the community to educate about offshore wind development. 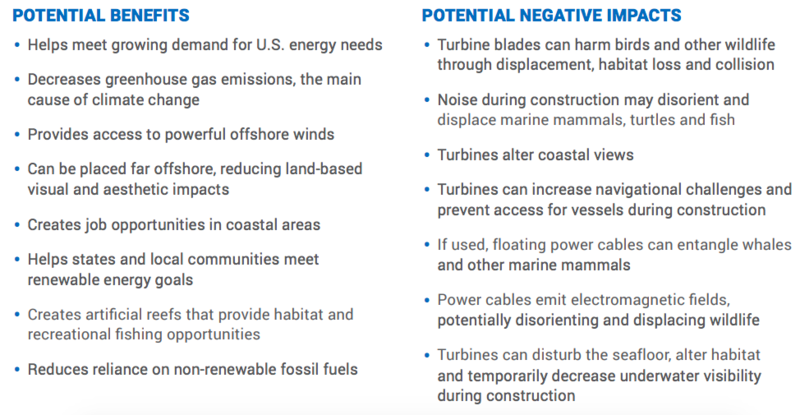 The Surfrider Foundation believes that the following principles must be applied when evaluating or planning for potential offshore wind projects. Offshore wind can be a very complicated, controversial, and confusing topic to those trying to get educated. If you are interested in learning more about the process by which a wind project gets approved, watch this 45-minute webinar about Offshore Wind given by Matt Gove, Surfrider Foundation’s Mid-Atlantic Policy Manager. If you are interested in educating members in your community about offshore wind, download Surfrider’s Offshore Wind Two-Pager. If you have additional questions, please contact Andy Brosnan (chair@easternli.surfrider.org) or Matt Govee (mgove@surfrider.org).